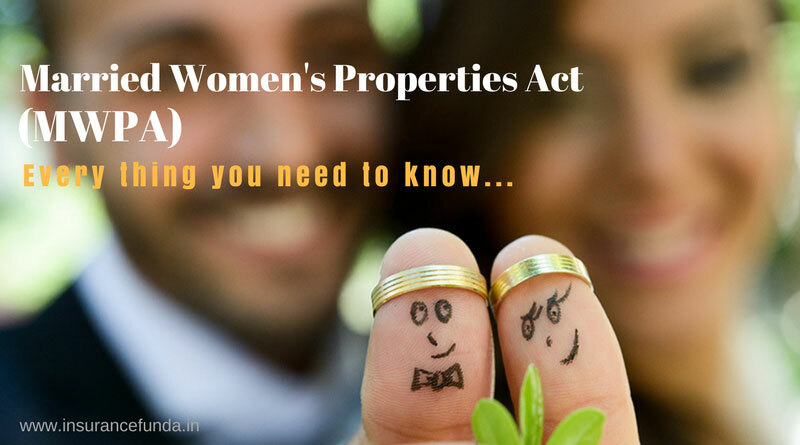 Married Women’s Property Act – MWPA – Every thing you need to know. Life Insurance policies are generally bought to financially protect the dear ones of the bread winner of the family, in case of an unfortunate event which affects his earning capacity. Policy holder normally expects that the claim proceedings from the policy will secure the financial needs of the family in his absence. But, unfortunately this need not happen in many a situations, especially, if the policy holder has an on going home loan or is a debtor owing to his business activities. One way to effectively fix this lacunae while taking your Life Insurance Policy is to, purchase it under Married Women’s Properties Act (MWPA). Under MWP Act, all the properties that belong to the women gets insulated and protected from the court attachments or any income tax department attachments that the husband has run up. Married Women’s Property Act – MWPA – How it Works.. The Married Women’s Property Act, 1874 (MWPA) was created to secure the assets owned by a woman against her husband, his creditors and relatives. Section 6 of the MWPA covers any insurance policy taken out by a man on his own life in favour of his wife and children. So, if you’re buying a life insurance policy under the MWPA for the benefit of your wife and children, the maturity as well as claim proceedings will always be their property. It cannot be claimed by your lenders nor will it be considered a part of your business assets (or estate). Thus the MWPA provides a simple method by which a married man can ensure that the benefits of his dependent(s) named in the policy are protected without formally creating a settlement deed or a trust. As per the MWPA, a trust is automatically created with the beneficiaries as trustees without the formal procedure of creating a trust. Any ‘married man‘ residing in India (except Jammu and Kashmir) can take a policy under MWP Act. ‘Married man’ mentioned here also includes a widower and a divorcee who can name his children, if he wishes, as beneficiaries in the policy. Beneficiaries defined in a policy that is covered under the MWPA can be your wife alone, just your child or children, or your wife and children together. As a policyholder, you cannot take a loan against the policies that are endorsed under MWPA. In case you’re surrendering the policy, the proceeds due shall also go to the beneficiaries endorsed under MWPA. beneficiaries mentioned in a policy endorsed under the MWPA cannot be changed after the policy is issued. Thus, even if the husband and wife divorce after the policy is taken, the beneficiaries (wife and/or children) will continue to remain the same. All the proceedings from the policy including maturity amount, death claim, loan and surrender value shall vest in the beneficiaries registered under MWP act. A new policy can be registered under MWPA by mentioning in the object of insurance column of the proposal. Insurance company may ask you to provide an addendum where you can give the details of actual beneficiaries intended under Married Women’s Properties Act. With the implementation of Insurance (Amendment) Act 2015, a new concept called beneficial nominees has been introduced. When a policyholder nominates his immediate family members such as parents, spouse or children, then the nominee or nominees will be beneficially entitled to the amount payable by the insurer. In other words if a beneficial nominee is available in the policy at the time of claim, other legal heirs will not have any claim on the money. The difference between beneficial nomination and MWP act endorsement is that while you can change the nominee of your policy any time during policy tenure, beneficiary registered under MWPA act cannot be change after starting the policy. Further, proceedings other than death claim is not protected in case of beneficial nominees.